If you are running Fedora Linux as a server, one issue you frequently encounter is strange permission denied error message triggered when you are accessing one of the available network services run on the server. There are a lot of network services to mention, but HTTP and FTP are two good examples of such services. Assume you are trying to access FTP server on your Fedora box. You type the IP address of the server and then supply the username and password. Voila!!! You thought you would be immediately logged in. But instead of seeing the files in your home folder, you are shown an error message. The error message may vary, from something like “Login incorrect for user blah” displayed by Midnight Commander, “500 OOPS: cannot change directory: /home/blah” from Total Commander, to other error messages shown by different FTP client programs. If you are 100% sure that you supply the correct user and password information, why couldn’t you get in? Let us assume that you have root access to the server so that you can remotely troubleshoot from the console. This post will give some guide on how you can solve this problem based on common configurations of a Fedora server. You might forget to open the FTP and HTTP port. If you are running iptables as your firewall program, you can invoke the following command to check if you have properly set the box to accept TCP connection from FTP and HTTP port. In above figure, you can see that the firewall has been properly configured. All incoming TCP traffic to FTP, HTTP, and HTTPS ports has been allowed. Hence, there is big chance that the cause of permission problem is caused by SELinux. Troubleshooting SELinux for this problem will be explained in the next step. Some Fedora users and administrators may consider SELinux as a nightmare instead of helper. To my personal assessment, SELinux is a valuable preset tool to harden the security of a Fedora/RHEL box. There are three levels or modes of SELinux deployment: enforcing, permissive, and disabled. In enforcing mode, SELinux will enforce the security rules and prevent the execution of each action that violates the rule. 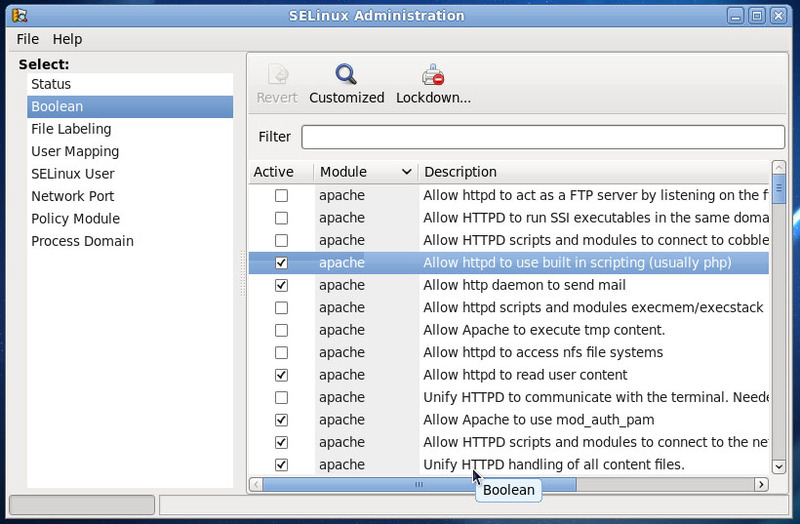 In permissive mode, SELinux will print or log warning of security violation instead of annulling the action. When SELinux is disabled, there is no further security enhancement. Security will be exerted based on the file access permission, firewall configuration, and built-in security embedded in the executed file or application. In the figure above, you can see the content of a sample selinux config file. As you read through the whole content of the file, you will notice that SELinux is running on enforcing mode with targeted type of filtering. This means that opening the firewall is not enough. We also need to properly set several boolean configuration flags for actions associated with FTP and HTTP(S) services. There are two methods to set SELinux boolean flags. The first method is using GUI. 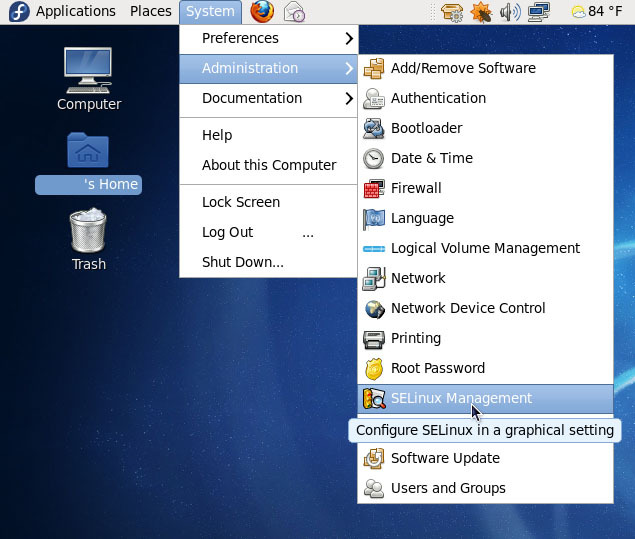 You can access SELinux management by clicking System > SELinux Management menu on your desktop. This step is depicted in the following picture. Sometimes when you don’t have physical reach to your server, you may need to do the administrative tasks remotely. This usually means that you will administer the server from command line-based SSH terminal. In this case, you may need to get familiar with getsebool and setsebool, two shell commands used to manage boolean configurations of SELinux. The command getsebool is used to get the boolean value of a certain SELinux configuration. Intuitively, the command setsebool is used to set the boolean value of an SELinux configuration. Since we have narrowed our discussion to security configurations related to FTP and HTTP(S), we will only use getsebool and setsebool to configure the security permissions of those services. Default security module for HTTP(S) service in SELinux is for httpd daemon from Apache Web Server. For other web servers, you might need to read their documentations about SELinux tweaks. The following figure compares configurations of a properly configured server and another one with HTTP permission issue. root# setsebool -P config_directive=[on|1|true] .. Similar with previous example, we use getsebool to get the value of security configuration related to FTP. The picture below shows configuration of two servers, one with a user-accessible FTP server and the other with permission problem when accessing FTP server. 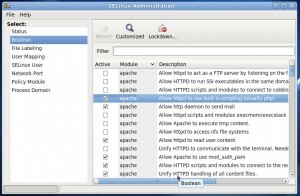 Now we are done with tweaking SELinux for FTP and HTTP(S) services. You shouldn’t have any more problems accessing your FTP and HTTP server. What a happy day! This entry was posted in Linux, Operating Systems, Technical Notes and tagged Fedora on September 7, 2010 by Tech Admin. Quick? To be honest it was pretty lengthy! Nevertheless it worked like a charm so thank you. The reading may be a bit lengthy because I want to give more clarity.Implementing the solution, however, should be quick, at least in my own experience. Great article. Very helpful. Thanks!